Synopsis : Information on good and bad fats and oils including trans fats, saturated and unsaturated fats, and Omega fatty acids. This section contains a wide variety of information on good and bad fats and oils - including the Omega fatty acids, trans fats, saturated and unsaturated fats. Fat is defined as one of the three main macro-nutrients: fat, carbohydrate, and protein. Fats are a wide group of compounds whose basis is in long-chain organic acids, called fatty acids. More particularly fats are esters of such organic acids formed with the alcohol glycerol. Glycerol is a triol, meaning that it has three chemically active -OH (hydroxyl) groups. Oil is the term usually used to refer to fats that are liquids at normal room temperature, while fat is usually used to refer to fats that are solids at normal room temperature. Unsaturated vegetable fats and oils can be transformed through partial or complete hydrogenation into fats and oils of higher melting point. The hydrogenation process involves "sparging" the oil at high temperature and pressure with hydrogen in the presence of a catalyst, typically a powdered nickel compound. An essential oil is a concentrated, hydrophobic liquid containing volatile aroma compounds from plants. They are also known as volatile or ethereal oils, or simply as the "oil of" the plant material from which they were extracted, such as oil of clove. An oil is "essential" in the sense that it carries a distinctive scent, or essence, of the plant. Essential oils do not as a group need to have any specific chemical properties in common, beyond conveying characteristic fragrances. They are not to be confused with essential fatty acids. Macerated oils are vegetable oils to which other matter, such as herbs, has been added. Commercially-available macerated oils include all these, and others. Herbalists and aromatherapists use not only these pure macerated oils, but blends of these oils, as well, and may macerate virtually any known herb. Base oils commonly used for maceration include almond oil, sunflower oil, and olive oil as well as other food-grade triglyceride vegetable oils. A fatty acid is a carboxylic acid often with a long unbranched aliphatic tail (chain), which is either saturated or unsaturated. Carboxylic acids as short as butyric acid (4 carbon atoms) are considered to be fatty acids, whereas fatty acids derived from natural fats and oils may be assumed to have at least eight carbon atoms, caprylic acid (octanoic acid), for example. The human body can produce all but two of the fatty acids it needs. These two, linoleic acid (LA) and alpha-linolenic acid (ALA), are widely distributed in plant oils. In addition, fish oils contain the longer-chain omega-3 fatty acids eicosapentaenoic acid (EPA) and docosahexaenoic acid (DHA). Other marine oils, such as from seal, also contain significant amounts of docosapentaenoic acid (DPA), which is also an omega-3 fatty acid. Although the body to some extent can convert ALA into these longer-chain omega-3 fatty acids, the omega-3 fatty acids found in marine oils help fulfill the requirement of essential fatty acids (and have been shown to have wholesome properties of their own). 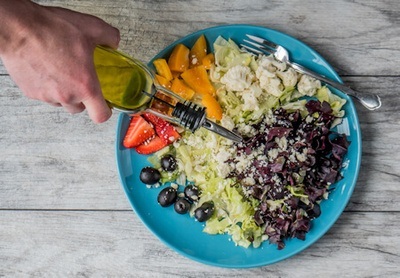 Person pouring oil from a bottle onto a plate containing vegetable and fruit salad. A trans fatty acid (commonly shortened to trans fat) is an unsaturated fatty acid molecule that contains a trans double bond between carbon atoms, which makes the molecule less 'kinked' in comparison to fatty acids with cis double bonds. These bonds are characteristically produced during industrial hydrogenation of plant oils. These fats are solid at room temperature and are contained in food products like butter, shortening, or the fat on meat products. Some types of oils like palm kernel oil and coconut oil, contain saturated fat. Whole dairy foods also contain trans fats. Trans fat is formed when hydrogen is added to vegetable oils, a process called hydrogenation which increases the shelf life and flavor of food containing these fats. Trans fats can be found in many types of pre-packaged items, like cookies, crackers and potato chips. Trans fats are also found in many fried foods such as french fries and doughnuts. Saturated fat and trans fat raise blood cholesterol levels, increasing a person's risk of developing heart disease. Research suggests that amounts of trans fats correlate with circulatory diseases such as atherosclerosis and coronary heart disease more than the same amount of non-trans fats, for reasons that are not fully understood. It is known, however, that trans fats raise the LDL ("bad") cholesterol and lowers the HDL ("good") cholesterol. They have also been shown to have other harmful effects such as increasing triglycerides and Lp(a) lipoproteins. They are also thought to cause more inflammation, which is thought to occur through damage to the cells lining of blood vessels. These fats are in a liquid form when at room temperature and in the refrigerator, they can be polyunsaturated or monounsaturated. Polyunsaturated fats help your body rid itself of newly formed cholesterol. They keep your blood cholesterol level down and reduce cholesterol deposit build up in your artery walls. Examples of polyunsaturated fats include - fish and fish oil, sunflower oils, corn and soybean. Monounsaturated fat is found in olives, olive and canola oil, most types of nuts and their oils and avocados. Scientists report in ACS Journal of Agricultural and Food Chemistry that olive oil withstands the heat of the fryer or pan better than several seed oils to yield more healthful food. They note that different oils have a range of physical, chemical and nutritional properties that can degrade oil quality when heated. Some of these changes can lead to the formation of new compounds that are potentially toxic. By-products of heating oil can also lower the nutritional value of the food being fried. The team wanted to find out which cooking oil can maintain its quality under high heat and repeated use. The researchers deep, and pan-fried, raw potato pieces in four different refined oils, olive, corn, soybean and sunflower, and reused the oil 10 times. They found that olive oil was the most stable oil for deep-frying at 320 and 374 degrees Fahrenheit, while sunflower oil degraded the fastest when pan-fried at 356 degrees. They conclude that for frying foods, olive oil maintains quality and nutrition better than seed oils. There are many different kinds of fats, but each is a variation on the same chemical structure. Fats are also sources of essential fatty acids, an important dietary requirements. Despite long-standing assertions to the contrary, fatty acids can also be used as a source of fuel for brain cells. Several edible vegetable and animal oils, and also fats, are used for various purposes in cooking and food preparation. Fat is one of the three main macro-nutrients: fat, carbohydrate, and protein. Fats that are saturated fats have no double bonds between the carbons in the chain. Unsaturated fats have one or more double bonded carbons in the chain. High Omega-6 Fatty Acid Levels Can Protect Against Premature Death - Linoleic acid is the most common polyunsaturated omega-6 fatty acid and study reveals the higher the blood linoleic acid level, the smaller the risk of premature death. Omega-3 from Fish Better Than from Flax for Cancer Prevention - Study shows Omega-3s from fish pack a stronger punch than flaxseed and other oils when it comes to cancer prevention. Eat Fat and Live Longer - High Fat Diet Increases Longevity and Strength - Recent study demonstrated high fat, or ketogenic, diet not only increases longevity but also improves physical strength. Saturated Fats May Actually Be Good For You - Diet intervention study (FATFUNC) raises questions regarding validity of diet hypothesis that dietary fat and particularly saturated fat is unhealthy for most people. Omega-3 Fish oil Supplements May Improve Muscle Function For Senior Women - Taking omega-3 supplements could improve muscle function potentially increasing quality of life and preventing unnecessary falls and loss of independence. Citation: Disabled World. (2019/01/21). Fats and Oils for Health Benefits. Retrieved 2019-04-20, from https://www.disabled-world.com/fitness/nutrition/fats-oils/ Direct Link: Fats and Oils for Health Benefits - Information on good and bad fats and oils including trans fats, saturated and unsaturated fats, and Omega fatty acids.